The Asian hornet has been slowly moving closer to the UK for a while now. Already a problem in France it likes nothing more than eating European honey bees. It's arrival here would be a problem for struggling bee populations. Like many invasive species the hornet has seen plenty of alarming and frankly slightly over the top coverage in the media. But they do pose a really serious threat to our honeybees. The hornets feed by hovering in front of bee hives. 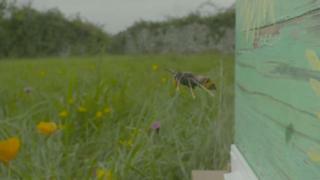 They intercept returning bees, bite their heads off and then eat the rest, a behaviour called "hawking". Exact figures are hard to come by but there are estimates are a single hornet can eat fifty bees in a day. They don't appear to empty entire hives of bees and are unlikely to wipe out honeybees on their own. But it's an unwelcome new problem for bees that are already facing problems with disease, other pests and wider environmental issues. Now researchers at the University of Warwick have sat down to try and work out how quickly the Asian hornet could take over the country. They took the single sighting of a hornet nest high in a tree in south Gloucestershire and extrapolated from that. As you can see from these maps taken directly from their research it takes just two decades for the hornet to pretty much take over the whole of the country. It's unfortunate that the behaviour of the hornet makes it perfectly suited to both invading and also surviving here when it arrives. The queens hibernate through winter in Asia and the rest of the colony dies off. Those hibernating queens can easily end up in this country stowed away in imported crates of Chinese pottery for example. Once here the queens can easily sleep through our winters before emerging. But there is good news. If we stay vigilant we can control and hopefully repel this invasion. Beekeepers can stay alert for hornets attacking hives and can build simple traps that will stop them in their tracks. And the rest of us can try and spot hornets in the wild and report them here or by using an app on our smartphones. You can learn more about what to look for here. As well as the hornets themselves their nests are very obvious. They are huge, the size of a large pumpkin, and found high up in trees. If you spot one report it. So, thanks to this work we know what the future could hold for our honeybees but the good news is we can all do our bit to help them and keep the invaders at bay.